My editor, Tim, knows I have a problem. He knows I spent for too long last year playing super Hexagon. Far too long. Seriously. Ahead of you’s an endless corridor. You’re speeding along it with a score counter creeping upwards the entire time. 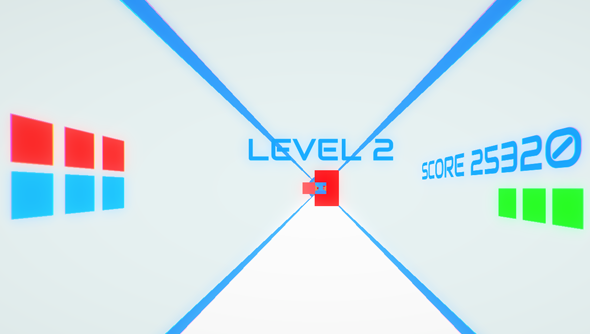 Between you and infinity are blue and red walls Tetris block walls. They stand obstinately in your way and you have to guide yourself through the gaps in their structure. It would be easy if you weren’t going so darn fast. You can stomach three collisions before death. Even with that generosity you will struggle to break 50,000 points. At first. You have one trick up your sleeve. You can relieve your stretched nerve endings for just a moment by hitting space bar. It activates an all too brief slow mo window. Giving you a vital second to find the gap in an approaching wall.